We are pleased to announce the launch of our brand new website! After six months of hard work and dedication, we are delighted to officially announce the launch of our new website. The updated site has a new modern look and feel, new logo, brighter colors, better browser compatibility and is mobile friendly. It includes changes to navigation, with simple dropdown menu that works great for both desktop and mobile versions plus a new site search. We also integrated our company blog with the new site and included our twitter feed and recent blog posts at the bottom of the home page to give you quick access to recent updates. 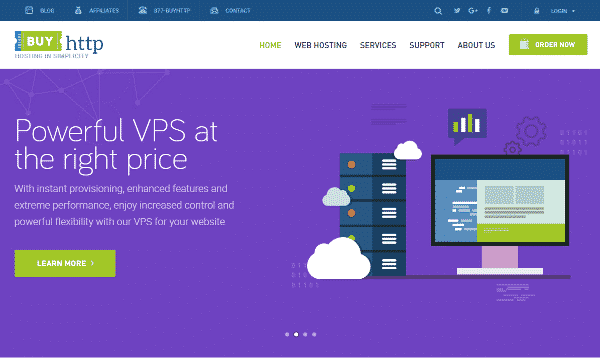 Our main goal is to provide customers and visitors an easier way to navigate and learn about BUYHTTP’s web hosting services and solutions and we will continue work on it every day to fix any bug and improve it even further. Client area also received an update, some bug fixes and name change. Old client area is now called Legacy Login and what used to be cloud client area is now the default client area. Both are accessible from the login menu at the top right corner of the page. Also we are in the process of slowly migrating our existing customers to the new client area which provides better user experience. We hope you find the new website attractive, engaging and easy to use and navigate. For any questions, suggestions, feedback or comments, please email us , comment below or use our new green little feedback widget located at the bottom left of the screen, we love to hear from you.